Venture down Ore Bank Road tucked into the southern corner of Rockingham County in the shadow of the Blue Ridge Mountains and you will find the Deep Run Ponds Natural Area Preserve. Dotted with sinkhole ponds, this local treasure supports many ecological features unique to the Headwaters Master Naturalists service area. Recently expanded from 700 to 900 acres, the land creating Deep Run Ponds Preserve was acquired in 2001 by the Natural Heritage Program arm of the Virginia Department of Conservation and Recreation. The Natural Heritage Program is common to every state, with a mission of conserving native biodiversity by preserving sensitive natural areas. The Projects Committee of the Headwaters Master Naturalists enjoyed a recent ramble through Deep Run Ponds Preserve guided by committee member Chris Bowlen and Natural Heritage Stewards Ryan Knopf and Wes Paulos, who work out of Roanoke. Ryan says the area offers ample potential projects should HMN decide to take them on. From trail work to flora and fauna inventories to hydrological monitoring … all efforts would be welcome. Shenandoah Valley Sinkhole Ponds are characterized by depressions created in limestone karst bedrock covered by 100 or more feet of sand and silt washed down from the adjacent Blue Ridge Mountains. 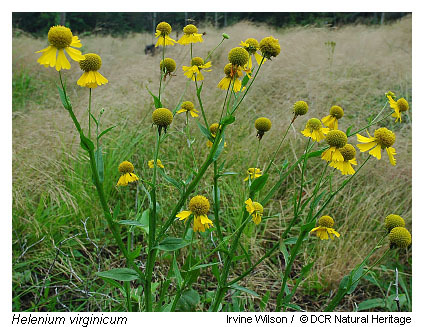 The rare Virginia sneezeweed (Helenium virginicum) grows only on the edges of sinkhole ponds. This perennial herb in the aster family is found here and in the Missouri Ozarks and nowhere else in the world. This ecological niche also favors other rare species found in the Deep Run Ponds Preserve, including the Black-fruited spikerush (Eleocharis melanocarpa), Northern St. John’s-wort (Hypericum boreale), Buxbaum’s sedge (Carex buxbaumii) and Northern bog clubmoss (Lycopodiella inundata). The eight numbered “vernal” sinkhole ponds of the preserve are fed by runoff seepage from the nearby roads. Most likely dry in the summer, visiting the area in winter is recommended for seeing the ponds full and too avoid the dense tick population active in the warmer months. 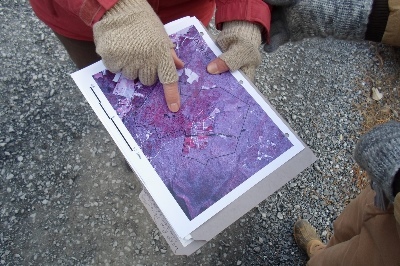 Once home to the Schreckhise nursery, the area’s sandy soils prompted the company to move its operation, but not before introducing an interesting mix of landscaping plants into the forest. Ryan says his agency’s plans for Deep Run Ponds include improved public access so more people can learn to care for this special place in our backyard. The Virginia Natural Heritage Program is in the process of hiring another steward who would work out of Verona. Having this third and more local program field worker will facilitate our chapter’s considerations of developing a future focus project out of this interesting place. The Shenandoah Chapter of the Virginia Native Plant Society (VNPS) has adopted Deep Run Ponds for organized previous trash removal and current garlic mustard removal event days. Consider joining master naturalist Chris Bowlen of VNPS on Tuesday, March 25 from 10 AM- 2PM for this year’s annual day of extricating invasive garlic mustard from Deep Run Ponds. Project committee members learning about sinkhole ponds. Pond #8 rarely is seen this wet. Ryan and Wes carrying out a trashed tire. February 17, 2014 in Projects.